Whey Protein Isolate Cold-Filtration is produced as a byproduct of cheese which undergoes two cold-water filtration processes in order to remove unwanted fat and lactose. The resulting powder is a great-tasting and easy-mixing protein option for post-workout nutrition or as needed in your daily diet! 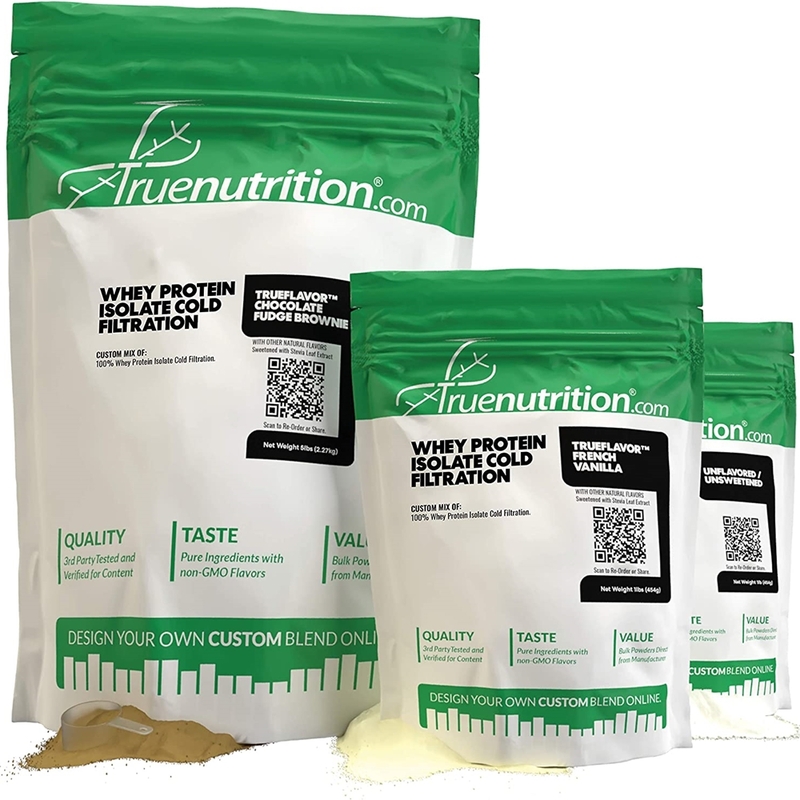 True Nutrition's Whey Protein Isolate Cold-Filtration is strictly sourced from the industry leaders in the USA. Providing 27g of protein to help support muscle-building! Taste: Light milky taste that goes great with most flavors! This whey mixes very smoothly! I actually forgot the shaker wire ball to my shaker and it still mixed smooth without ANY clumps! I ordered the Chocolate Fudge "normal" flavoring which was a bit too sweet for me. Order the "light" flavor if you don't have much of a sweet tooth like me. I tried two flavors, Cookies & Cream, and strawberry, and was satisfied with both. Price/value is fantastic. I chose the least expensive shipping option, because I was not in a hurry. Package arrived quickly and in great condition, the whole experience and product exceeded my expectations. My first time ordering from TN and, what I have to say about them is fast shipping, high quality products, easy to consume and prices are unbeatable. Havent come across any issues with this product. I had ordered the chocolate fudge brownie with normal flavor intensity, the taste is awesome and it easily dissolves. TN will definitely be my go to for all/any kind of supplements. I have been ordering TN's Whey Isolate Cold for well over a year now. The quality is unreal, I have tried unflavored and Fudge Brownie. The unflavored is quite mild, but does have a milky aftertaste that my wife does not approve of. However, we both agree on the fudge brownie - which is sweetened with Stevia by-the-way. This is the most cost-effective way to ensure I am getting the protein I need. At $0.80 per serving, this really can't be beat. I have used other cheap "Protein" powders in the past with a protein-to-serving ratio of 60% or less and found that my digestion takes a turn for the worst... But not with TN's product! I recently PR'd on the main lifts (500 Squat, 320 Bench, and 545 Deadlift). I don't think I would have hit these numbers this quick if not for TN - thanks guys! Highly recommend this product! Finally!! Someone gets it. This is hands-down the best protein I've ever used and I have used a lot of different brands in my quest to find one that I can live with beyond the first 2 or 3 shakes. The regular intensity flavor is perfect for me. It's very mild and unassuming unlike most proteins on the market. This makes it highly drinkable. In water you practically don't even have to shake this stuff to get it to mix. It's a lititle tougher going using milk but it's still mixes better than any other protein I've used except for say True Nutrition's own Peptopro. So far I have tried the strawberry sorbet and the chocolate peanut butter cup. Both are fantastic. If you like a little more flavor just go heavy on the flavoring option. For me though the normal intensity is perfect. The chocolate peanut butter cup is my favorite flavor ever. And let's face it, for puriry you will not do better then 27.1 grams of protein in a 30 gram scoop. Like everything else from this company, their protein is unbeatable. Smooth, no clumps, easily digestible coming from someone with a sensitive GI system. True favors taste great with no crap ingredients added. High quality protein powder that mixes easily and tastes great. I bought the TrueFlavor chocolate fudge brownie and it was perfect for me as I'm not a fan of overly sweet protein powders. It digested very well, and gave me no issues. I have tried most of the well known high quality protein powders out there and this product is now my favorite. The other thing that I really like about True Nutrition is I read that when you order an amount of protein, they weigh out that amount then add flavor to the amount of protein that you ordered. I weighed the protein when I received my 5 pound bag and it weighed over 6 pounds. Thumbs up, keep up the great work! Great taste, excellent mixibility, and no bloating! !